Now before you scoff, turn up your nose, and walk away in disgust, muttering something about never choosing canned food over fresh, bear in mind that a good canned tomato product should taste better, much better, than a "fresh" tomato in winter. It should have a nice balance of sweet and tangy, and be soft enough to break down nicely when making sauce, but not so soft as to be "mushy." But most importantly, it should taste like, well, a tomato. Granted, nobody's going to be making salsa or salads with canned tomatoes, but if your heart's desire is a nicely balanced tomato sauce for your pasta dish, or a base to flavor a soup or stew, a canned tomato product is the way to go. That is, unless you happen to be of Italian-American descent, in which case you probably spent one last weekend in summer jarring tomatoes with the family, and this story will likely serve as mere entertainment. The rest of us look on in envy. Either way, we wanted to get to the bottom of this. So we lined up 11 brands and eight members of our editorial staff for a classic blind taste test of whole canned tomatoes. The mix included a couple of readily available American brands like Hunt's and Del Monte, a couple of premium American brands including Muir Glen and San Marzano, and a few imported Italian brands, including Ciao, Vantia, and Rega Rega, for comparison purposes. It's worth noting that one popular American brand, Contadina, proved difficult to find. At four supermarkets and food shops in Manhattan and two in Brooklyn, we saw other Contadina products, but not the whole tomatoes. Why did we include imported Italian brands? (And we're talking about brands that grow and can their tomatoes in Italy, not ones with Italian-sounding names that actually grow and can in the States.) There are a number of reasons, but they all boiled down to one thing: taste. Do they taste better? Do San Marzano variety tomatoes grown in the San Marzano region taste better than say, San Marzano variety tomatoes grown in California (which is what San Marzano brand tomatoes really are; they've come nowhere near Italy)? Or is there a brand of canned tomatoes that aren't San Marzanos, say Muir Glen, that actually taste better than the often-hyped San Marzano tomato? But also, we wanted to take this as an opportunity to clear up some confusion about the vaunted San Marzano. Is it a region or is it a tomato? Both, says Colman Andrews, The Daily Meal's editorial director. "'San Marzano' applies both to a variety of tomato and a geographically specific region," he says. "There are roma tomatoes and assorted hybrids grown in San Marzano -- perfectly fine, but not as delicious as San Marzanos -- and San Marzano tomatoes grown as far from Campania as Australia or California. What you want are San Marzanos from San Marzano. Some brands widely exported, besides Cirio, include Cento, La Bella San Marzano, La Valle, Strianese, Titina's, and Carmelina. Some, but not all, of these qualify for a European Union 'denomination of protected origin' designation (D.O.P. in Italian), and the cans bear stamps certifying this fact, as well as membership in the Consorzio San Marzano. In general, these are the best ones to buy -- though non-D.O.P. San Marzanos can be very good, too." Each brand was tasted raw and evaluated on the basis of the tomatoes' juiciness, meatiness, salt level, sweetness, tanginess, and overall flavor to arrive at a score out of 100 points. The scores were then averaged together. Anything scoring below 60 points was considered a fail. The clear winner? 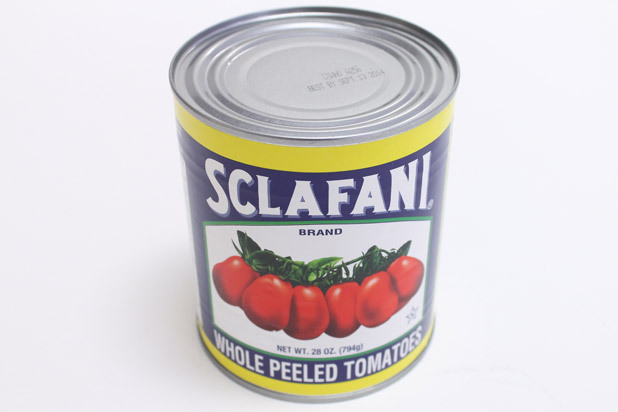 Sclafani ($2.59 for 28 ounces), averaging 82.9 points out of 100. A favorite among pizzerias, editors praised its "great texture" and "nice balanced flavor." The bottom of the pack? Cento ($3.29 for 35 ounces), averaging 66.9 out of 100. We didn't like its "very processed flavor" and "mushy" texture that bordered on being "rotten." Check out our slideshow for further comments from the editors on the other brands, as well as some great tomato recipes.